As simple as this may sound having the interpreter confirm the patient’s identity is a key factor in providing safe and responsible healthcare. Asking who the patient is and being greeted by a room of family and nods may not be the easiest way to just assume who the patient really might be. Being able to correctly identify allergies, interpreting ingredients, and medication could be a lifesaving opportunity that a properly trained healthcare provider can assist with. Being able to correctly correlate the type of medication in the patient’s native language can help avoid any unnecessary reactions. Having a certified or qualified medical interpreter present can prevent any of these “translation” errors. Clear communication between the patient and medical team with the assistance of the interpreter is a major role upon discharge. The proper communication will play a vital role in the recovery stage for the patient. Making sure that they possess a clear understanding of their medications, post care, proper dosages, possible side effects, and potentially harmful reactions is vital to home care. This may not necessarily translate directly to onsite medical care. But during the discharge phase, it is important that the patient is aware of how to administer their medications as intended by the prescribing physician. Ingestion of a topical medication orally could have life threatening effects. The patient fully understanding their after care is a top priority. One pill three times a day, three pills once a day or one pill every 3 days can really get misleading if the message is not delivered clearly and is understood. Again, a professional medical interpreter can explain the proper dosage guidelines, proper times, and proper aftercare with way better ease. 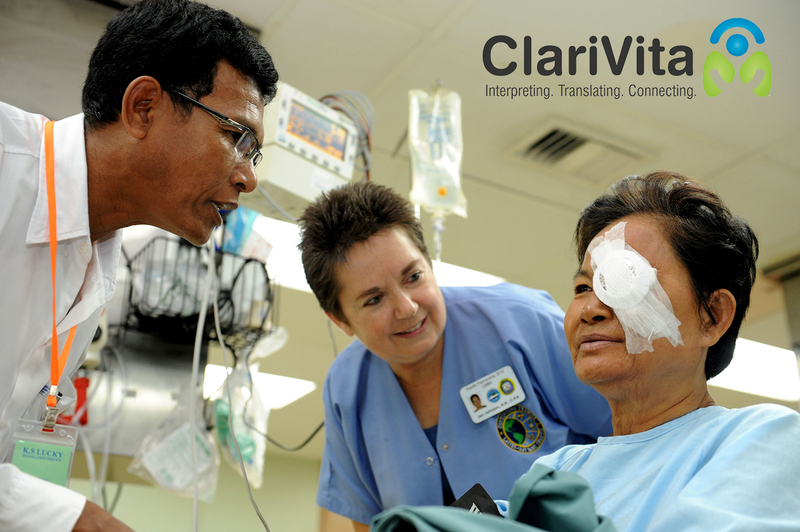 At ClariVita we can assist with on-site Medial Interpretation and Translation as well as proper training of Multi-lingual staff.